Marjorie Jackson (aka Margie) and her husband, Danny Boone, teach Tai Chi classes in South and North Central Austin. Their teaching style is relaxed, yet enthusiastic and lends to an enjoyable classroom experience. Margie also has Hatha Yoga classes in South and North Central Austin. 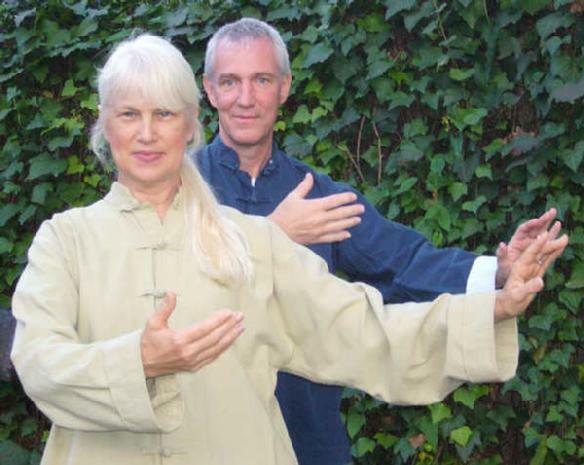 Marjorie and Danny studied and developed their Tai Chi skills in Los Angeles at the internationally acclaimed Tai Chi Academy of Master Kai Ying Tung. Both trained for over 10 years with Master Kai Ying Tung. Marjorie has been teaching Tai Chi & Hatha Yoga for 30 years. This ancient Chinese martial art form is designed to enhance the body, mind, and spirit. This exercise form promotes health, fitness, and longevity. By practicing the sequence of movements, students can develop strength and coordination, while reducing stress and increasing mental focus. Tai Chi is beneficial as a supplement to other athletic activities and therapeutic for recovering from physical injuries. This is excellent exercise for all ages and fitness levels. Email for current class start dates and other information like what to wear, type of shoes, etc. Please RSVP before attending. Tuition is usually $10 or $12 per class. Email to RSVP and to get the current schedule and what to bring to class. Start any week. Margie teaches levels 1,2 & 3 during the same class, so a new beginner and an intermediate student would both be comfortable. Tuition is usually $10 or $12 per class. Click here Meditation & More to view Margie’s YouTube meditation/visualizations, healing tools, self-massage, breathing exercises, stretching and more. Please email or call (512) 916-8919 for address in 78745 and to RSVP. at World Tai Chi Day 2012, Austin TX (excerpt).